Artistic shelving from Earthy Timber is an investment in beauty and high-end style. Essential for storage and a delightful way to display objects of emotional value, luxury shelving has moved on to embrace “must-have” status in your kitchen – or almost any other area in your home. 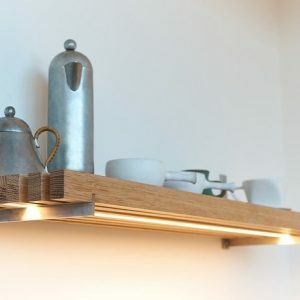 With an entry level price of £500 per shelf, these custom pieces from Earthy Timber are a stylish and chic addition to any room. Space saving, our bespoke, made-to-measure shelves can be established in previously unused areas against a wall, in an alcove or under a window, offering a place to show off flowers or store bric-a-brac or recipe books. We offer full stave, wide stave or single plank shelves, as well as modern, minimalist “floating” shelves. We can also create and design high quality mantels and window sills. These artistic niche products, all made to order, and are ideally suited to complement large rooms within stylish, luxury homes. Earthy Timber sources a variety of wood only from within the UK and Europe, such as English Oak, English walnut, Sycamore, London Plane, as well as European timbers, Wild Apple, Wild Pear, Sycamore, Hornbeam and Burr Oak. Our artisan wooden shelves are strong yet truly stunning, show-casing the natural patterns within the timber and brought to life through our specialist finishing techniques. As a timber specialist, Earthy Timber is unique in the market place in that we offer a complete, comprehensive start-to-finish service. Not only do we source our own timber, we also vacuum kiln-dry each slab in our on-site chamber. Each piece is then finished entirely by hand, with our specialist techniques to bring out is stunning, natural beauty. The timber for your shelves (through our vacuum kiln-drying process) will have been subjected to a specialist process to extract its moisture content to below 10%. It through this intense, in-depth process that your shelves will be sturdy, robust and long-lasting. These are shelves that meld themselves seamlessly into the fabric of your home; luxury products for those who appreciate functional art. As William Morris once said, “Have nothing in your home that you do not know to be useful, or believe to be beautiful”. We would be pleased to review images of the room where your shelves will live – it helps us to source the ideal pieces of timber for you – so don’t forget to bring these, or email them to us. Please use our contact form to send us the details of your project. We are looking forward to hearing from you. Earthy Timber only works with customers who are ready to go ahead with a project and who already have a budget in mind.